This morning, I spent quite a lot of time attaching a brass hook into a coconut. It's harder than you think. I tried nails and screws at first but I actual managed to bend a couple of fairly chunky nails whilst trying to hammer them into the coconut, and trying to get a screw in proved to be futile. I got the end of the coconut quite easily, although it did involve using a fairly chunky saw. Usually, I'd take the end off completely and then thread some wire into the interior of the coconut through the three black weak spots on the end to hang it, but given I managed to get the end off whilst leaving the flesh intact, I thought it may be interesting to hang it up via something attached to the outside. In the past, we've had to resort to using power tools to get into a coconut. That depiction of a coconut hitting the ground, gently bouncing and splitting open in two which was in - I think - a Bounty commercial a few years ago is nothing but a lie. Getting into a coconut is tough. And so as I was hammering away, pointless bending nail after nail whilst trying to get one to stick into the coconut, it got me to wondering why on earth we eat coconuts at all. A long, long time ago someone must've said "I wonder whether the inside of that thing which is really hard to get into is poisonous..?" and hacked their way into a coconut and tried it. As far as I know, there aren't many animals which eat ripe coconuts in the wild (I think it's mostly insects getting into them before they are ripe) and so I doubt a person watched an animal cracking one open to get inspiration. Truth is, I don't even really like coconut. The flavour is OK, but I find the texture quite unpleasant. There's something a little bit cloying about the flecks of plastic-y flesh you get in coconut which I can't bear to eat. I don't even like Bountys. Having said that, coconut cream is one of the best ways I've found to avoid using dairy and tomatoes when making a curry; it makes a great base for the sauce. Thankfully it doesn't have that weird textural thing going on and tends to disappear into the spices and other flavours which infuse throughout a good curry. 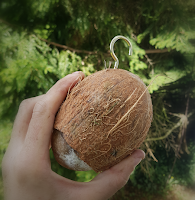 And so, why was I putting a hook on a coconut? Especially if I wasn't planning to eat the coconut myself. Well, it's all for the birds, you see. I read last year that wild birds rather like coconut. So we tried cutting the end of a coconut and hanging it up, and it went surprisingly quickly. We tried it several times, having to move from tying them up with string to using metal wire because our plucky squirrels became quite adept at quickly biting through the wire and then eating the coconut on the ground. 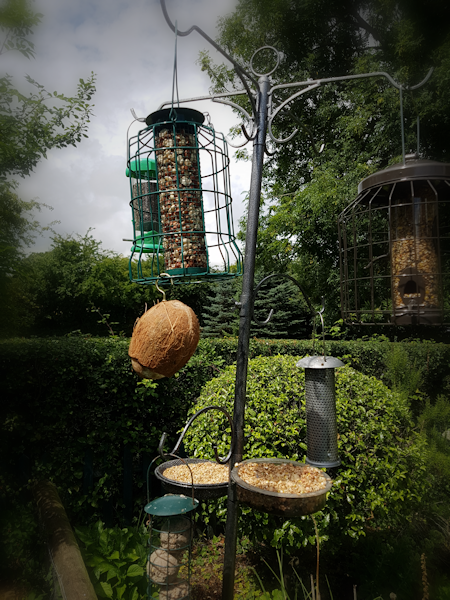 In fact our last coconut ended up falling to the ground when a squirrel launched itself from a tree onto the coconut, only to find that the coconut's attachment wasn't strong enough to take the weight of the squirrel too. Don't worry, the squirrel was fine. It ate some coconut and then ran off. Unusually, that coconut was last seen being carried away by a fox in the middle of the night on CCTV. What a fox is planning to do with a coconut we shall never know, but did appear to carry it away quite proudly. Oh yes, squirrels love coconut! (Don't know why, as they presumably evolved in separate ecosystems). In our old place we had a problem with squirrels in the loft, so I got a live trap, which I initially tried baiting with peanuts but they weren't interested. Got some advice to bait it with Bounty bars and it never failed after that!